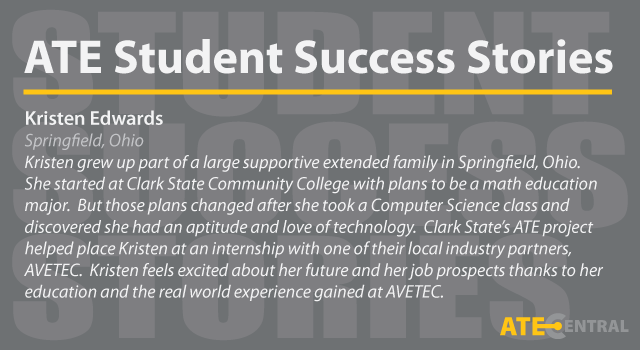 ATE Student Success Story Videos highlight the struggles and triumphs of a diverse set of students in community college settings. With support and guidance from ATE centers and projects, their lives and careers have been changed for the better. Each video documents a unique success story, but all of them have a common theme: technician training has the power to change lives. 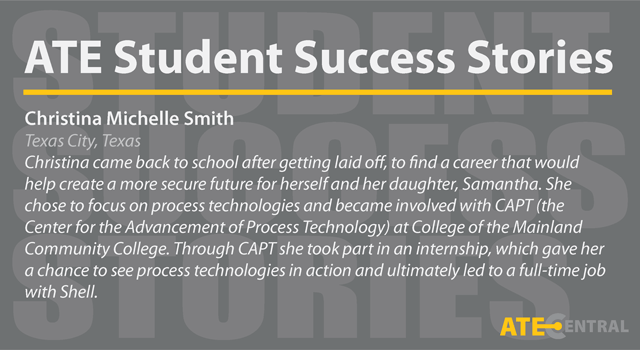 In Texas City, Texas, Christina Smith is going back to school to study process technology at College of the Mainland. Learn more about Christina's new career path, her success in providing for her young daughter, and the role of ATE in helping her move forward. Daniel Burman had a successful career in real estate but was never happy. That all changed when he returned to school to study solar photovoltaics. 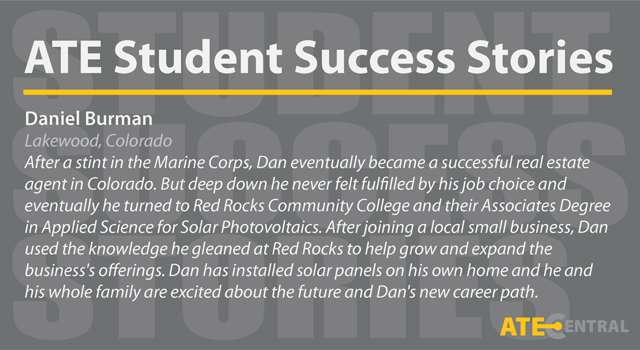 He's now working in the alternative energy field with a local business and is not only making a good living, but also feeling excited about his job and career choice. 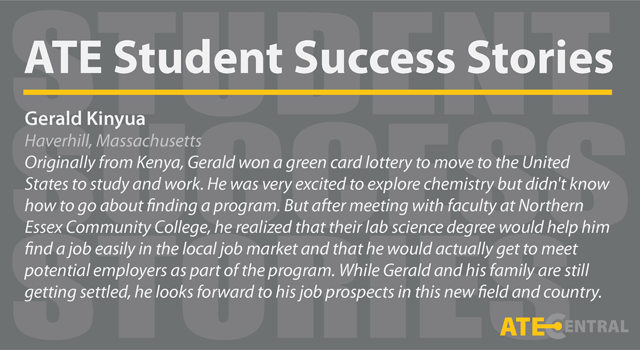 Gerald Kinyua moved from his homeland of Kenya hoping to get an education and explore a new career in chemistry. At first he found it difficult to negotiate the education system in a new country, until he connected with Northern Essex Community College. Now he feels right at home in his program and is ready to look for employment in his chosen field. Josiah Roberts successfully completed a two-year program at Naugatuck Valley Community College and is now transferring into a four-year mechanical engineering degree program at a local university. The ATE collaborative wheelchair project he worked on during his time at Naugatuck helped convince him that engineering was the field for him. Kristen Edwards thought she wanted to be a math education major until a computer science class changed the course of her career. After more coursework, and an ATE sponsored internship with a local business, she's discovered a new passion and a new path. Llew Powell worked at a succession of unsatisfying jobs, but he knew he liked problem solving and fixing things. Those skills have come in handy since he started his program at Benjamin Franklin Institute of Technology working on hybrid vehicles; now he feels more engaged in his day-to-day work and prepared for a career in the automotive industry. Matthew Davis thought he knew what he wanted to do after high school, but decided to expand his career options after a year of working as a residential electrician. 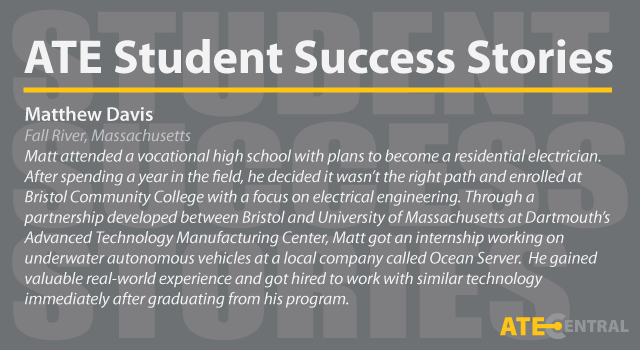 Discover his new educational focus, learn about underwater autonomous vehicles, and see how ATE helped Mathew secure a career more suited to his interests. 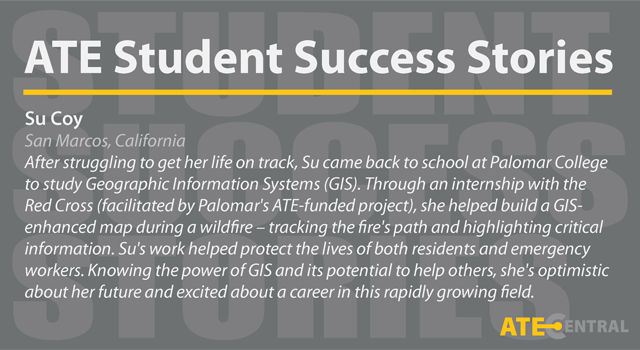 Su Coy is studying GIS through Palomar College's ATE project and loving it. She never thought much about education as a young woman, and had some struggles along the way, but now she knows she is on the right path with GIS and is excited about her professional and personal victories. Anthony Francis returned to New York for school after spending his childhood on the small Caribbean island of St. Lucia. See how collaborative projects, rich mentoring, and skillful networking helped Anthony secure a job in Mechatronics- a top 10 emergent technology. 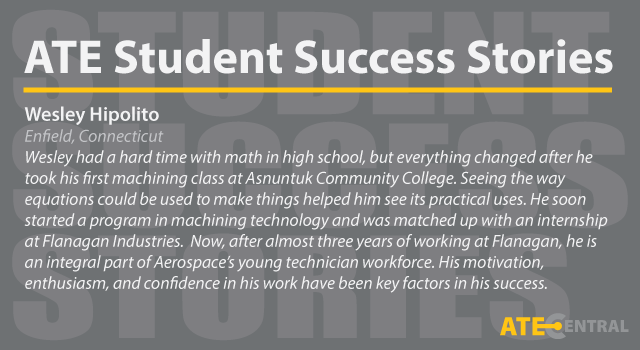 Wesley Hipolito was introduced to machining technology through the College Connection Program at Asnuntuk Community College. Now, after more coursework, an ATE sponsored internship, and a seamless transition into the workforce he has established himself as an integral part of the future of Aerospace. These videos are available for download and use under the Creative Commons Attribution-NonCommercial-ShareAlike (CC BY-NC-SA) license. For commercial or other use not covered under the terms of this license, please contact info@atecentral.net.